I posted the base card of this set a while back. 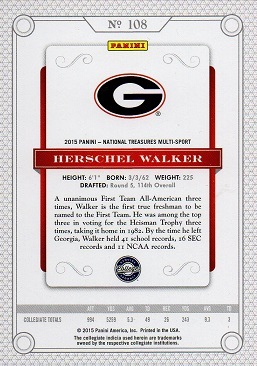 That card was serial numbered to 99. This Century Silver example is serial numbered to 25, this being #20. 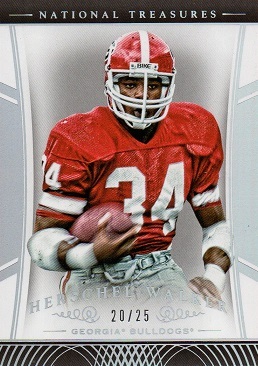 In the case of Herschel Walker, the card numbers are always 108 in this set. But that's not all. There is also, Century Gold(ser #'d to 10); Century Black(ser #'d to 5); and Century Blue(ser #'d to 1). Not to mention four potential printing plate one of one's. 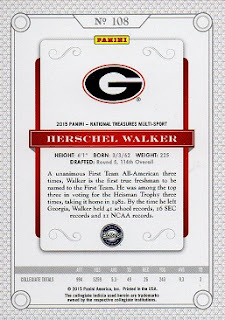 In any case, I can check off another Panini Herschel card as it makes it's way into the Hoard.